I am slowly forcing my book obsession on my son. This weekend was employee appreciation weekend for Borders employees (which is one of the few reasons I work those 4 little hours every week,) So with my extra 17% discount I went a little book crazy[er.] I got myself a new copy of The Perks of Being a Wallflower, mine has long ago gone missing, City of Bones by Cassandra Clare which I have been fighting reading, and Life as We Knew It by Susan Beth Pfeffer–she’s an up-and-comer who is getting great reviews. All these YA titles, I know, but summer is around the corner and I am gonna need some light reads to balance out the heavy ones we are doing in my book club. Benji is the one who made out like a bandit. 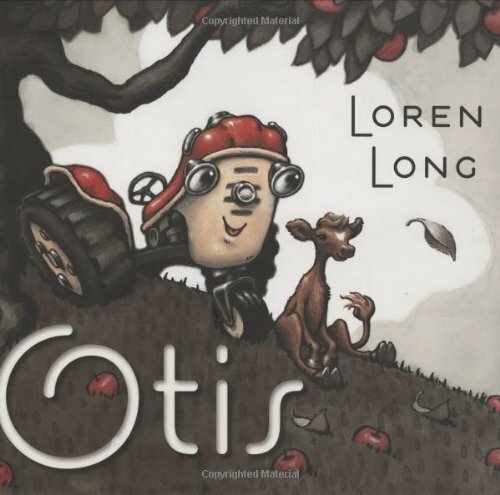 He got Little Quack, two new Elephant and Piggie Books, Time For Bed, and Otis by Loren Long. Otis the one I am truly excited about. The artwork in this book is so beautiful and full of contrast that it easily holds Benji’s attention and the story of the little tractor and his best friend the calf is something that he will be able to enjoy and learn from well into his kindergarten years. I was going to get the board book version of it simply for it’s sturdy build but after talking with a friend about it, she convinced me that this is a book that I am going to want to have in hardcover as a keepsake after he out grows it. She was right. After just one read through of this book, I am in love with it. It’s sweet and sad and uplifting and delightful to the eye and I think is a must have for any baby boy collection, although I think this a necessity for every picture book lover out there too.